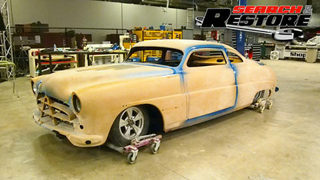 (ANNOUNCER)>> ON THIS EDITION OF SEARCH AND RESTORE, OUR TRIFIVE CHEVY CONTINUES ITS REBIRTH AS TEAMS FROM AROUND THE COUNTRY ARRIVE FOR FINAL ASSEMBLY. AND AN OLD FRIEND RETURNS WITH CASPER, ALONG WITH A DESIRE TO GIVE BACK ON HIS OWN DIME. (TIM)>> THE BEGINNING OF WEEK THREE, I DON'T KNOW IF I WORE THE GUYS OUT FROM WEEK TWO BUT I GOT A WHOLE NEW CREW THIS WEEK AND WE'RE ACTUALLY GONNA SEE COLOR ON THE WHOLE OUTSIDE OF THE CAR. THERE'S MANY LITTLE STAGES THAT I REALLY GET EXCITED ABOUT WHEN YOU'RE BUILDING A FULL HOT ROD, BUT WHEN THE PANELS ARE GOING FOR THE VERY LAST TIME, THAT'S WHEN I GET REALLY EXCITED. WEEK ONE IS METAL, WEEK TWO IS BODY, WEEK THREE IS PAINT. SO YOU WANT TO GET A LOT OF PAINT SPECIALIST GUYS AND GUYS THAT REALLY LOVE TO DO IT. SO THAT'S WHAT I GOT THIS WEEK, A LOT OF GUYS THAT ARE REALLY GOOD PAINT AND BODY GUYS. THIS THING IS 100 PERCENT LEGIT, BAD HOT ROD. 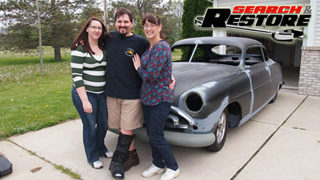 (ANNOUNCER)>> EACH NEW VOLUNTEER BRINGS A RENEWED SPIRIT AFTER LEARNING ABOUT OUR CAR'S OWNER, 31 YEAR OLD CHAD TERHAR. 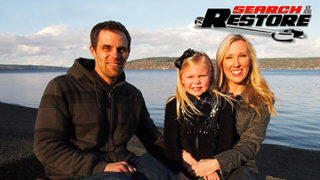 THIS HUSBAND AND FATHER HAS THE LAST 11 YEARS PARALYZED FROM THE WAIST DOWN FROM A DIRT BIKE ACCIDENT. (JIM)>> WHEN IT HAPPENED I THOUGHT, WELL HIS LIFE'S OVER. YOU KNOW, HE'S JUST GONNA BE A BITTER PERSON FOR THE REST OF HIS LIFE AND BE ANGRY AT THE WORLD. AND HE WAS ABSOLUTELY THE OPPOSITE. (CHAD)>> HEY RICK, WHAT'S UP. (ANNOUNCER)>> HIS COWORKERS FOR THE PAST 15 YEARS CAN ATTEST TO THAT. CHAD WORKS ON INDUSTRIAL MACHINERY AT AUTOMATED SYSTEMS OF TACOMA, AND THE GUYS HERE REALIZED RIGHT AWAY VERY LITTLE ACCOMMODATIONS WERE NEEDED TO KEEP CHAD A PRODUCTIVE EMPLOYEE. ( )>> YOU DON'T REALLY REALIZE THAT HE'S IN A WHEELCHAIR MOST OF THE TIME. YOU GET USED TO THE FACT THAT HE'S IN ONE BUT THE THINGS THAT HE DOES AND THE WAY THAT HE IS AND STUFF, IT DOESN'T HOLD HIM BACK FROM ANYTHING. (ANNOUNCER)>> AND IT DIDN'T HOLD HIM BACK FROM PURSUING HIS DREAM ON WHEELS. (CHAD)>> EVER SINCE I WAS A LITTLE KID AND MY DAD WOULD TELL YOU THE SAME, THAT EVER SINCE HE WAS LITTLE HE WANTED A '55 NOMAD. 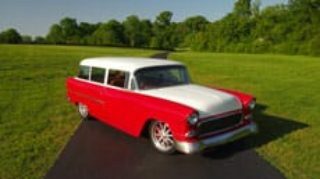 WELL SAME THING, WHEN I WAS LITTLE I KNEW IT WOULD BE HARD TO FIND THE '55 NOMAD, AND I LIKE THE TWO DOOR WAGON JUST AS MUCH. SO THAT WAS THE CAR I ZEROED IN ON. 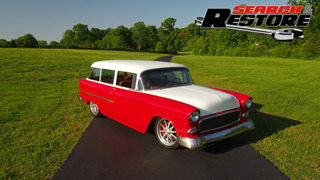 (TIM)>> THE CRAZY THING BACK IN 1955, YOU COULDN'T JUST GET THE '55 CHEVY. THEY HAD MANY BODY STYLES. THEY HAD THE SEDAN TWO DOOR, THEY HAD THE HARDTOP TWO DOOR, THEY HAD A FOUR DOOR SEDAN, A FOUR DOOR HARDTOP, AND A FEW DIFFERENT STATION WAGONS, AND THEY HAD A CONVERTIBLE. AND THEN THE TOP DOG, THEY HAD A TWO DOOR NOMAD WAGON THAT THE ROOF WAS EVEN DIFFERENT. 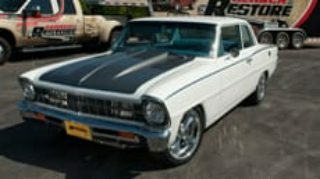 THERE WAS THREE TRIM PACKAGES, A 150, A 210, AND A BEL AIR. EACH ONE HAD MORE TRIM AND MORE CHROME ON IT. THE COOL THING ABOUT THE TWO DOOR WAGONS, IT'S NOT THAT HARD TO CHANGE IT FROM THE SIMPLE ONE TO THE FANCIER ONE. JUST DRILL SOME HOLES AND SOME MORE TRIM CLIPS. (JIM)>> WHEN HE BOUGHT THAT CAR, I HELPED HIM BUY IT AND THEN HE PAID ME BACK. AND BY THE TIME WE GOT IT HOME AND STARTED TEARING INTO IT I THOUGHT, OH MAN! I THINK WE HAD OUR ROSE COLORED GLASSES ON, BUT THAT HAPPENS ALL THE TIME. (CHAD)>> ACCEPTING THE FACT THAT IT WOULD NEVER BE AS NICE AS MY DAD'S CAR IS NOW, BUT YOU KNOW, I WAS OKAY WITH THAT. HE'S EXCITED FOR ME, BUT HE'S DEFINITELY AFRAID OF IT BEING NICER THAN HIS. (ANNOUNCER)>> BUT FOR THAT TO BE TRUE THE HANDYMAN STILL HAS A LONG WAY TO GO. (JAKE)>> IT DOESN'T TAKE MUCH, YOU'VE JUST GOT TO MOVE IT JUST THAT TINY LITTLE BIT. ( )>> I'VE GOT A PRETTY GOOD GAP ON THIS SIDE. (ANNOUNCER)>> PERSEVERANCE IS KEY IN CAR BUILDING, AND BEFORE TOO LONG. (JAKE)>> WELL IT'S DEFINITELY A LOT BETTER. WE GOT ALL THE GAPS AND EVERYTHING LINED UP, BUT WE'RE DEFINITELY READY TO START BOX IN THE TOP AND GET IT READY FOR SOME PAINT. 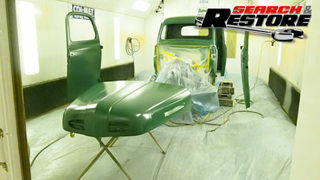 (TIM)>> THE COOL THING ABOUT THIS RUSTED FENDER PRIMER, THE VERY FIRST TIME YOU SAND IT, IT HAS A BUILT IN GUIDE COAT. A GUIDE COAT IS SOMETHING WHEN YOU SAND IT, IT CHANGED COLOR. BUT AFTER THE FIRST TIME IT'S SANDED, YOU NEED TO USE A LITTLE DUPLICOLOR GUIDE COAT. YOU DON'T WANT TO USE NORMAL, JUST CHEAP AEROSOL PAINT, YOU WANT TO USE REAL GUIDE COAT. THIS IS WHAT IT'S MADE FOR. I KNOW EVERY TIME WE TURN AROUND WE'RE TALKING ABOUT SANDING, BUT TO GET THESE THINGS FLAT AND STRAIGHT, AND ALL THE REPAIRS WE HAD TO DO ON THIS THING, IT TAKES A LOT AND A LOT OF SANDING. (TOMMY)>> NOW WHAT WE'RE GONNA DO IS WE'RE GONNA TAKE THIS AND WE'RE GONNA SAND IT OVER THERE AND TEN DOO WAA.....ARRRRRERRGH. AND IT'S GONNA BE AWESOME, WHOO! (ANNOUNCER)>> AND WITH THE SPEED IN WHICH THIS CAR NEEDS TO BE BUILT, IT'S A GOOD THING THAT A SOLID GROUP OF VOLUNTEERS STEPPED UP TO GET CHAD'S RIDE INTO ITS PROM DRESS. (JASON)>> LOOKING FOR ALL THE FLAWS AND IMPERFECTIONS. 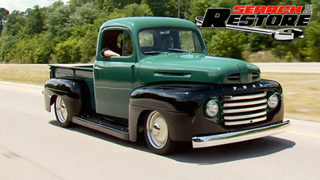 (ANNOUNCER)>> GUYS LIKE JASON ANDERSON OF ANDERSON CLASSICS AND CUSTOMS IN CLAREMORE, OKLAHOMA. HE'S HAPPY TO BE HERE TO HELP A FELLOW HOT RODDER IN NEED. (JASON)>> THE STORY OF HIM IS UNBELIEVABLE. (CHAD)>> I WAS GONNA REPLACE THE ROCKERS. (JASON)>> ANYBODY TRYING TO TACKLE A CAR IN THAT CONDITION ANYWAY BY THERE SELF AND HAVING THE FLOOR CUT OUT. MAN THAT'S A BIG JOB FOR ANYBODY YOU KNOW? THERE'S A LOT OF SHOPS THAT WOULDN'T EVEN TAKE THAT KIND OF PROJECT ON. (ANNOUNCER)>> BUT TAKING IT ON IS EXACTLY WHAT THESE GUYS HAVE DONE, AND PROGRESS CONTINUES ON THE SHOEBOX WELL INTO THE NIGHT. NEXT, IT'S TIM IN HIS ELEMENT WHEN THE TRIFIVE GETS SOME COLOR. (ANNOUNCER)>> WITH THE PRIMER SANDED OUT, THE CHEVROLET SAYS FAREWELL TO THE PREP BOOTH FOR THE LAST TIME AND GETS PREPPED FOR COLOR. (JAKE)>> WHAT I'M DOING IS GETTING READY TO DO SOME SEAM SEALING RIGHT ON THE DRIP EDGE HERE. (TIM)>> I HAVEN'T KNOWN JAKE FOR VERY LONG, BUT I KNOW HIS WORK. WHEN HE SENT ME PICTURES OF ALL THE PROJECTS OF MUSCLE CARS HE'S DONE. 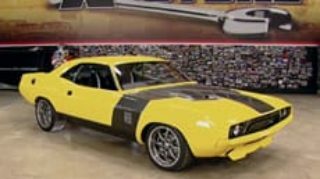 YEAH, WE'RE NOT DOING REALLY A TRUE MUSCLE CAR ON THIS, BUT IT'S STILL PAINT AND BODY AND IT'S A BIG CAR THAT'S GOT TO BE FLAT. SO IT'S NICE TO HAVE JAKE ON THE TEAM. NOW WE'RE GONNA DO THE MASKING. PUT THE MASKING PAPER AND THE TAPE IN THE PLACES WHERE YOU DON'T WANT THE OVER SPRAY TO GET. 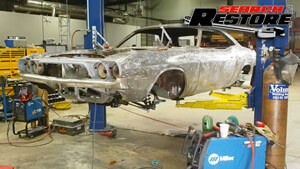 THEN WE PUT A COAT OF SEALER OVER THE WHOLE CAR. THAT HELPS MAKE SURE THE CAR IS ALL THE SAME COLOR CAUSE SOMETIMES WHEN YOU'RE SANDING THAT LAST COAT OF PRIMER, YOU MIGHT GET A LITTLE CUT THROUGHS HERE AND THERE. WHEN WE PICKED THIS CAR UP FROM CHAD, HE SAID HE'D LIKE IT RED AND WHITE. SO I PICKED THIS DUPONT CHROMO BASE, REALLY BRIGHT RED, SOLID, NO METALLIC. WE'RE GONNA DO A LITTLE BIT DIFFERENT TWO TONE WITH A WHITE ON THE TOP BUT BRING THE WHITE DOWN ON THE BODY A LITTLE BIT, AND GET READY TO PUT SOME RED ON IT. SO WE'RE SPRAYING THIS CAR SOLID COLORS. THAT MEANS NO METALLICS. IF YOU'RE JUST NEW AT SPRAYING COLOR, YOU MIGHT WANT TO START OUT WITH SOME SOLID COLORS. SO IF YOUR OVERLAP OR YOUR SPRAY TECHNIQUE ISN'T QUITE PERFECT, IT'S NOT GONNA SHOW UP AS BAD AS A SOLID AS IT WOULD WITH A METALLIC, OR CANDIES, OR PEARLS. THOSE CAN BE A BOOGER. WE GOT DANNY TAYLOR COMING IN THIS WEEK TO HELP WITH PAINT AND GRAPHICS. THIS GUY IS TOTALLY AWESOME WHEN IT COMES STRIPES, PIN STRIPPING, GRAPHICS. HE ALSO WORKS WITH DUPONT. HE'S ONE OF THOSE GUYS IF YOU HAVE A PAINT PROBLEM IN YOUR SHOP, HE COMES AND HELPS YOU FIX IT. (DANNY)>> I GUESS WHAT I DO THE FIRST TIME IS ACTUALLY I START OUT WITH MAYBE A CENTER LINE. (TIM)>> WELL I GUESS WHILE I WAS IN THE BOOTH SWEATING AND WORKING, EVERYBODY ELSE WAS OUT HERE PLAYING AND WATCHING DANNY TAYLOR PUT ON A PIN STRIPPING SEMINAR. (DANNY)>> IN MY OPINION THE THINNER STRIPES LOOK A LOT BETTER THAN THE WIDER STRIPES. THEY'RE A LITTLE BIT HARDER TO DO BUT THEY LOOK A LOT BETTER. (TIM)>> LEARNING HOW TO PIN STRIPE FROM DANNY TAYLOR IS LIKE GETTING BATTING CAGE PRACTICE FROM BABE RUTH. THAT DUDE'S LEGIT. (DANNY)>> YOU CAN JUST MAKE IT UP AS YOU GO. THERE'S REALLY NO RIGHT OR WRONG WAY. IF YOU'VE GOT A GOOD BRUSH, YOU'RE HALF WAY THERE. DO THAT ONE, DO IT AGAIN, DO IT A LITTLE SLOWER. WHENEVER I'M STRIPING I ALWAYS SAY, DO YOU WANT TO TRY THAT? USUALLY THEY DON'T, BUT IF YOU CAN GET ONE PERSON TO TRY IT, THEN EVERYBODY WANTS TO TRY IT. IT'S JUST DOING IT OVER AND OVER AND OVER AND GETTING THE FEEL OF THE BRUSH. AND THE MORE TIME YOU PUT IN, THE BETTER YOU GET. A LITTLE HAPPY TREE, A LITTLE HAPPY TREE! THERE ARE A LOT OF GUYS OUT THERE THAT ARE INTERESTING IN HOW TO DO WOOD. THAT'S VERY, VERY DIFFICULT. I'M GONNA SHOW YOU HERE HOW DIFFICULT THAT IS. YOU LAY DOWN THE FIRST COLOR, AND THEN YOU PULL OUT THIS MAGIC WAND. YOU CAN ACTUALLY MAKE WOOD PRETTY EASY. IT'S A LOT EASIER THAN IT LOOKS WITH THE RIGHT TOOL. AND IF YOU DON'T LIKE THE WAY IT LOOKS, YOU CAN GO RIGHT BACK OVER IT. (TIM)>> SO WE GET THESE VOLUNTEERS TO COME IN AND HELP. SOMETIMES I LIKE THEM TO DO A LITTLE BIT OF FUN STUFF TOO. SO I LET JASON SPRAY THE WHITE COLOR ON THIS THING AND I'M GONNA GO HAVE ANOTHER DOUGHNUT. ( )>> OH YEAH! (ANNOUNCER)>> A LITTLE BIT OF UNMASKING AND IT'S DANNY'S TURN TO BRING HIS TOUCH TO THE PROJECT. (DANNY)>> HEY TIM, CAN YOU PICK? (TIM)>> I ALWAYS LIKE THE ARTIST TO PICK. 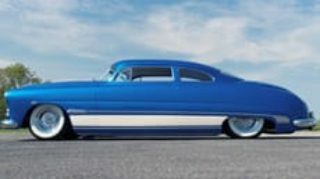 I WISH MORE CUSTOMERS, WHEN THEY COME TO A SHOP TO HAVE A HOT ROD BUILT, THAT THEY JUST TRUST THE BUILDER. TO ME EVERY BUILDER HAS ITS OWN STYLE, KIND OF LIKE A PIECE OF ART. WHICH ONE DO YOU LIKE? (DANNY)>> THE ONE I COLORED IN THE BEST. (TIM)>> I LIKE THAT ONE TOO. (DANNY)>> OKAY COOL, I'M GONNA PUT A SEPARATION LINE BETWEEN THE RED AND THE WHITE. SOMETIMES I JUST DON'T FREE HAND. IT'S QUICKER, AND EASIER, AND DEFINITELY STRAIGHTER IF IT'S DONE LIKE THIS. I USE TAPE A LOT JUST AS A SPACER. SO I TAPE THE THREE QUARTER OVER THE QUARTER, WHICH GIVES ME HALF AN INCH WHEN I TAPE DOWN HERE. THE STRIPE'S PROBABLY GONNA BE A LITTLE BIT LESS THAN HALF INCH CAUSE I MIGHT OUTLINE IT INSIDE THAT. THREE QUARTER INCH TAPE, SIDE BY SIDE, GONNA PEEL ONE OFF, AIR BRUSH, ANOTHER ONE OFF, AIR BRUSH, ANOTHER ONE OFF AND AIR BRUSH. GIVE IT THAT VIBRATION LOOK. (ANNOUNCER)>> THE AIR BRUSH CAN GO BACK TO ITS CASE IN EXCHANGE FOR A STRIPING BRUSH. IT'S A MATTER OF FOLLOWING THE TAPE LINES HE MADE EARLIER, THEN UNMASKING THOSE LINES ALONG WITH THE REST OF THE CAR. THEN IT GETS A LAYER OF PROTECTION. (TIM)>> I THINK IT'S AFTER MIDNIGHT. GETTING READY TO FINALLY PUT SOME CLEAR ON THIS THING, RUN THE BAKE CYCLE ON IT. BASICALLY TAKE A NAP AND COME BACK IN THE MORNING. (ANNOUNCER)>> COMING UP, IT'S THE CUSTOM TOUCHES THAT WILL HOPEFULLY TURN CHAD'S HANDYMAN INTO A SHOW WINNER, NEXT! (ANNOUNCER)>> BACK AT THE TECH CENTER, AND AFTER ONLY THREE HOURS SLEEP DAY 12 BEGINS WITH THE CAR FULLY PAINTED AND CLEAR COATED. 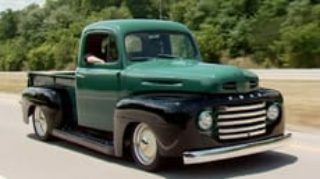 (TIM)>> WELL WE KIND OF PRIDE OURSELVES AROUND HERE ON SEARCH AND RESTORE OF ACTUALLY BUILDING REAL, AWESOME HOT RODS THAT YOU'D BE HAPPY TO TAKE TO A CRUISE NIGHT OR EVEN A CAR SHOW. SO AFTER IT'S CLEARED, WE PULL IT OUT OF THE BOOTH AND WE SPEND A WHOLE BUNCH OF TIME. YOU GUYS JUST SEE LIKE THIS MUCH OF THIS MUCH THAT WE ACTUALLY DO WET SANDING AND POLISHING. (CHRIS S.)>> SANDING, SANDING, SANDING, YEAH. PEOPLE WILL CALL YOU THREE DAYS LATER, WHAT ARE YOU DOING? UH, I'M SANDING! THAT'S JUST PART OF THE DEAL. I DON'T THINK ANYBODY REALLY LIKES IT. (TIM)>> 800, 1,000, 1,250, 2,000, 2,500, AND FINISH WITH 3,000 GRIT AND IT'S ALMOST GOT A LITTLE SATINY SHINE BACK ON IT BEFORE WE START RUNNING THE BUFFER ON IT. OKAY GUYS, THIS IS THE STUFF WE'VE GOT TO GET DONE TODAY. THE SOONER WE GET IT DONE, THE SOONER WE CAN QUIT. I PROMISE NOT TO ADD TOO MANY MORE THINGS TO THE LIST. I MIGHT ADD A FEW THINGS, BUT IT'S REALLY PRETTY SIMPLE STUFF. SO IF SOMEBODY WANTS TO JUMP ON AND GET THE INSIDE OF THAT CAR CLEANED OUT FIRST. SINCE WE'RE DOING A LITTLE BIT OF CUSTOM STUFF ON THIS BUT STILL KEEPING TRIFIVE STYLE, CARRIAGE WORKS SENT US ONE OF THEIR '55 CHEVY REPLACEMENT BILLET GRILLS. AND AGAIN, GOING ALONG WITH THE THEME, NOTHING'S BRIGHT AND SHINY, IT'S UNPOLISHED BRUSHED FINISH, LOOKS PRETTY COOL! NOW I'VE JUST GOT TO FIGURE OUT WHERE ALL THAT GOES. 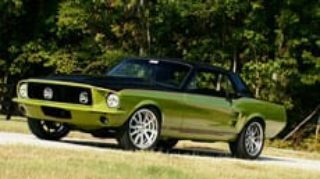 ONE THING NICE ABOUT HAVING THE TECH CENTER IN NASHVILLE, TENNESSEE, WE'RE VERY LUCKY TO HAVE ADVANCED PLATING IN OUR HOME TOWN, ONE OF THE TOP CHROME SHOPS IN THE WORLD. (ANNOUNCER)>> YOU'VE SEEN ADVANCED PLATING'S WORK ON THE POWERBLOCK BEFORE. THEY'VE BEEN A PART OF SEVERAL NOTABLE PROJECTS, LIKE MUSCLE CAR'S RED SLED IMPALA. THEY GAVE TRUCK'S PROJECT CLASSIX ITS DISTINCT COPPER FEATURES, AND DONATED ALL THE CHROME RESTORATION FOR ANDY WILSON'S NOVA, CASPER. (TIM)>> SO WE SENT OLE CAMO CHRIS ON AN EXCURSION ACROSS THE BIG TOWN OF NASHVILLE, CAMO PANTS ON. ( )>> CHRIS HOW YOU DOING. (ANNOUNCER)>> FOR THIS BUILD, TIM WAS GOING FOR AN INDUSTRIAL LOOK. SO WE ASKED THE CREW AT ADVANCED PLATING TO WORK UP CHAD'S TRIM IN BRUSHED NICKEL, AND THERE'S NO DOUBT THAT THIS WILL HELP MAKE THIS CHEVY DISTINCT. (TIM)>> IF YOU PAY ATTENTION, THE PRODUCTS THAT WE USE, WE USE A LOT OF THEM OVER AND OVER, AND THERE'S A REASON FOR THAT. WE CALLED OUR FRIENDS AT UNISTEER. THEY NOT ONLY STEPPED UP AND GAVE US THE POWER RACK AND PINION FOR THE FRONT SUSPENSION. WE TOLD THEM ABOUT ALL THE OTHER COOL STUFF WE WERE DOING. THEY WENT ONE STEP HIGHER AND SENT US A CHROME TIED INTO THE IDIDIT TILT COLUMN, THEIR STEERING SHAFTS AND JOINTS TO TIE IT ALL TOGETHER. YOU LOOK DOWN IN THERE AND IT LOOKS LIKE JEWELRY DOWN THERE, PRETTY AWESOME! (STEVE)>> I'VE GOT THE BASIC LIGHTING SYSTEM HOOKED UP. I'M GONNA TEST IT WITH A PLAIN NINE VOLT BATTERY TO MAKE SURE IT DOES WHAT IT'S SUPPOSED TO DO. JUST TRYING WITH A SMALL TEST AND WE'RE GOOD TO GO. (ANNOUNCER)>> FOR HEADLIGHTS, CHAD'S GETTING A COOL UPGRADE WITH A SET OF 35 WATT HID'S FROM ORACLE LIGHTING. THESE SEALED ROUNDS COME READY TO INSTALL IN MOST CLASSIC CARS AND TRUCKS. OURS FEATURE SURFACE MOUNTED DIODE RINGS THAT CREATE A UNIQUE HALO EFFECT, FOR WHICH ORACLE IS FAMOUS. THESE ARE VISIBLE IN BROAD DAYLIGHT, OPERATE ON NORMAL 12 VOLT POWER, AND ARE GOOD FOR OVER 100,000 HOURS OF USE. (IAN)>> TIMES LIKE THIS GUYS NEED A LITTLE MOTIVATION, READY? GO, GO BUILDERS, GO, GO, GO BUILDERS! GO, GO BUILDERS, GO, GO, GO BUILDERS! GO TIM, GO TIM, GO TIM! (ANNOUNCER)>> NEW WEEK, NEW CREW, AND MORE WORK TO DO. HIX DESIGN RETURNS WITH THEIR WELL CRAFTED INTERIOR PIECES TO PUT INTO THE TRIFIVE. (TIM)>> OKAY, LETS SEE WHAT WE GOT. MAN, LOOK AT THAT, NICE! (ANNOUNCER)>> THESE RENDERINGS GIVE EVERYONE AN IDEA OF WHAT TO EXPECT. (TIM)>> I LIKE THAT, I LIKE THAT A LOT. 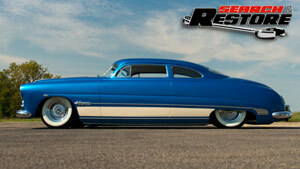 IF YOU KNOW ANYBODY THAT'S A REAL HOT RODDER, YOU KNOW WE CAN'T LEAVE ANYTHING ALONE. WE GOT THIS AWESOME, GREAT MOTOR, CONNECT AND CRUISE LS THREE FROM PACE PERFORMANCE. I MADE SURE IT WAS OKAY WITH THEM. CAN WE RELOCATE THE COILS? WE GOT SOME DON HARDY RACE CAR VALVE COVERS THAT WERE SMOOTH. NO BOLT BOSSES FOR THE COILS. SO DANNY TAYLOR PUT SOME GRAPHICS TO TIE IN FROM THE BELT LINE ON THE OUTSIDE AND THE COOLEST PART OF ALL, WE HAVE A PICTURE FROM CHAD THAT HIS TATTOO ON THE BACK OF HIS ARMS SAYS STRUGGLE. SO WE LOOKED AT THAT PICTURE AND DANNY TOOK IT AND PUT IT IN THE MIDDLE OF THAT VALVE COVER WITH THE EXACT LETTER STYLE. THAT'S JUST AWESOME! (ANNOUNCER)>> ARRIVING TODAY TO PAY IT FORWARD, ANDY WILSON AND HIS WHITE NOVA CASPER FROM LAST SEASON'S FIRST BUILD DROVE TO THE TECH CENTER TO LEND A HAND. (ANDY)>> WELL IT'S BEEN A BUSY YEAR. (TIM)>> HEY ANDY, HOW ARE YOU DOING? (ANDY)>> HEY TIM, HOW ARE YOU? (TIM)>> THANKS FOR COMING AND HELPING. (ANDY)>> ENJOYING THE CAR, LOVING IT, TAKING IT TO SHOWS. I JUST WANT TO BE ABLE TO HELP AND VOLUNTEER SOME OF MY TIME. MAYBE MAKE A DIFFERENCE. I'M HAPPY TO BE HERE, READY TO GET TO WORK. (TIM)>> I KNOW ALL THE VOLUNTEERS THIS WEEK, YEAH MOST OF THESE GUYS, THEY COME IN AND THEY SPEND A LOT OF TIME TO LEAVE THEIR SHOP TO COME HERE TO THE TECH CENTER TO VOLUNTEER, AND WE CAN'T BE HAPPIER AND THANK THEM ENOUGH FOR DOING THIS. (ANNOUNCER)>> THANKS ALSO GOES OUT TO THE DOZENS OF PRODUCT SUPPLIERS FOR THEIR DONATIONS. (TIM)>> THESE FABRICATION GUYS THAT HAVE BEEN AROUND FOREVER MAKING STUFF FOR TRIFIVE'S. MAKE THIS REALLY COOL ALUMINUM MACHINE STUFF THAT GOES ON THE DASH TO REPLACE THE FACTORY STAINLESS THAT GETS WORN OUT OVER THE YEARS, AND SOME SEAL PLATES THAT ALL MATCHES. AND WE'RE GONNA SCUFF THEM WITH SOME SCOTCH BRITE TO MAKE SURE THAT IT ALL DIES DOWN SO THAT INDUSTRIAL BRUSH THEME IS TIED THROUGHOUT THE WHOLE CAR. SO AGAIN WE USED AN IDIDIT COLUMN AROUND HERE. PAY ATTENTION, USE A LOT OF REALLY GOOD STUFF OVER AND OVER, THERE'S A REASON BEHIND THAT. YOU CAN'T GO WRONG WITH AN IDIDIT COLUMN. THEY'RE RIGHT EVERY SINGLE TIME. (ANNOUNCER)>> DAKOTA DIGITAL GAVE US ONE OF THEIR NEW VHX SILVER ALLOY INSTRUMENT SYSTEMS. A PERFECT FIT INTO OUR REFURBISHED STOCK BEZEL. LOKAR PROVIDED A FLOOR MOUNTED SHIFTER FOR THE AUTOMATIC TRANS, AND HOLDING EVERYTHING TOGETHER ARE FASTENERS FROM ARP. (TOMMY)>> WE'RE JUST ABOUT READY TO HEAR THIS OLE GIRL FIRE UP, BUT BEFORE WE CAN DO THAT WE'VE GOT TO INSTALL THE STARTER. 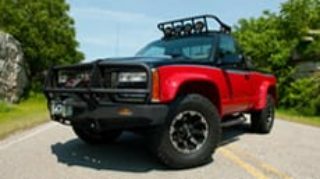 SO WE GOT THIS POWER MASTER COMPACT UNIT FROM SUMMIT RACING. IT OUGHT TO WORK LIKE A DREAM. (TIM)>> THE END OF WEEK THREE. THAT'S PRETTY AMAZING WHAT WE'VE GOT DONE IN 14 DAYS. I KNOW, SOONER OR LATER WE'RE GONNA RUN OUT OF ALL STAR TEAM, BUT THEY KEEP CALLING AND WE KEEP BRINGING THEM IN, AND WE KEEP GETTING IT DONE.